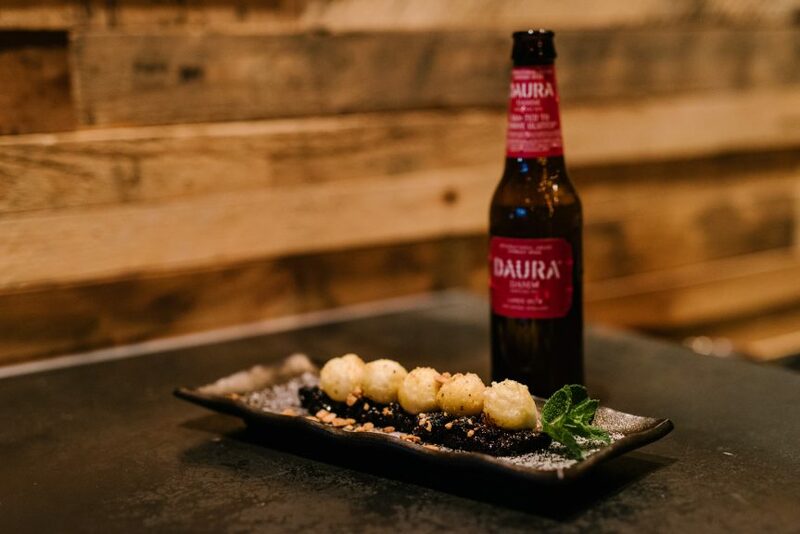 Daura has integrated in the Toronto premium restaurants and food community to target diners who are living gluten-free, looking for gluten-free options or just want another beer option. What better way to showcase this than gather a group of food-loving people for an ON THE MENU dinner at Kanpai Snack Bar paired with Daura Damm beer. As a background, Daura Damm is the crafted to remove gluten beer from Damm. It is the first beer in Spain to guarantee a gluten content below 3ppm, which is very low considering Health Canada’s threshold for gluten-free food is up to 20ppm. The event started with an introduction about Daura Damm from Floris van Neerrijnen (Brand Manager for North America), a talk on gluten-free by Rachael of GlutenFreedom Inc, and welcoming remarks from Owner Trevor Lui of Kanpai Snack Bar and Marian Staresinic of Branding and Buzzing. Prepping the Piggie Smalls (Pork Belly). Daura went so well with the menu. It was light, smooth and refreshing, and the BEST part was it tasted like normal beer. What I learned from others in my table was that other beers that have been crafted to remove gluten didn’t taste like beer anymore. For the spicy dishes like the Taipei Tater Slaw, Daura was just perfect to cool the burn without overpowering the flavor. For the savoury dishes like MC Hammer, Piggie Smalls and Taiwanese Fried Chicken, Daura enhances the flavor of the spices. Daura’s carbonation and slight bitterness help refresh the palate between bites of chicken and pork. For the desserts like the Ping Pong Beignets and Let Your Backbone Slide, Daura helps change the overall experience by adding a bitterness to it. It helps reduce the sweetness level, and at the same time gives a new unique flavor profile. At the end of the event, each of us gets to go home with a Daura goodie-bag with a 6-pack of Daura and a “Straight Outta Cabbagetown” cap. What a way to end the night! Thank you so much to Branding and Buzzing, Daura Damm and Kanpai Snack Bar for hosting such an event! Shout out to Rey of EatNMingle for giving me the opportunity to take part in this event as well! NOTE: All Non-Instagram Photos are credited to Jeffrey Chan, Courtesy of Daura Damm. Posted on May 31, 2016 by Travelling FoodiePosted in Canada, Food, Ontario, TorontoTagged events, products, restaurants.